The second-best wide receiver in the league behind Pittsburgh's Antonio Brown, Jones led the league with 1,871 yards. He had 10 drops to Brown's five, but that doesn't take away from his incredible season. Saving his best season for his 13th in the league, Palmer has had an MVP-caliber year in 2015. Particularly impressive going downfield, he threw for 1,123 yards on passes travelling 20 or more yards downfield. 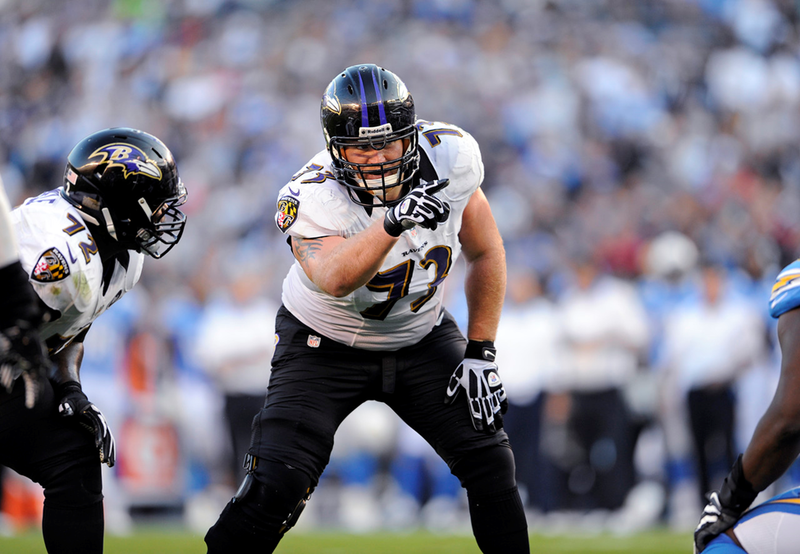 It was a down season for Baltimore, but once again Yanda was at the top of his game. He allowed just one sack in pass protection and was a force in the running game. Incognito played every snap for the Bills this season, and he had by far the best season of his career. Solid in pass protection, where he allowed two sacks, five hits and 12 hurries, he really excelled as a run-blocker, posting the second-highest PFF run-blocking grade. Earning the highest PFF grade ever given to a linebacker in a single season, Kuechly was incredible against the run and in coverage. He recorded 59 tackles resulting in a defensive stop and missed just six tackles. It's telling that Jeffery was the Bears' best player despite missing seven games, but that's how good he was when he played. He dropped only two of the 56 catchable passes thrown his way. Finally getting back to his best after suffering a torn ACL in 2013, Atkins was once again Cincinnati's best player this year, racking up 15 sacks, 10 hits and 61 hurries, while impressing against the run, too. As has been the case since he was drafted in 2007, Thomas was again the best player in Cleveland. In 753 pass-blocking snaps this year, he allowed just two sacks. For his career, he allows a sack only once every 217.5 pass-blocking snaps. Five sacks are the most Smith has allowed since his rookie season, but he also had his highest PFF grade as a run-blocker -- by some distance -- and allowed only 22 total pressures. Miller still had a dominant season as a pass-rusher, despite posting the second-lowest sack total of his career. He had 11 sacks, 21 hits and 50 hurries, and had a positive grade against the run for the fifth straight season. Johnson, who is contemplating retirement, remains the best Lions player. He finished the 2015 regular season with a ninth straight positive grade. Five sacks and six hits might not seem like much, but Daniels added an impressive 42 hurries. He finished the regular season with 32 total defensive stops, proving he can handle the run, too. What's ridiculous is that this was somehow a "down year" for Watt, who had been even better the past three seasons. He was still outstanding in 2015, however, racking up 18 sacks, 34 hits and 39 hurries. What an improvement from Freeman, who missed just five tackles all season after posting double-digit missed tackle numbers in his first three seasons in the league. He finished 2015 with an impressive 53 total defensive stops. In his second year in the league, Robinson averaged a whopping 17.5 yards per reception, the most of any wide receiver with more than 50 receptions. Vernon was fantastic in 2015, edging out the grade of teammate Ndamukong Suh. Vernon's 10 sacks might not sound dominant, but he added 30 hits and 40 hurries. Outstanding against the run, Joseph had his best season by some distance. He had 26 total pressures as a pass-rusher. It was another tremendous season for Beckham, who dropped just four of the 100 catchable passes thrown his way. Harrison might be a player who excels far more in one area than the other, but the man known as "Big Snacks" again feasted on opposing offensive linemen against the run. His 51 defensive stops were tied with the Rams' Aaron Donaldfor the most by a player on the defensive interior. Gronkowski was his usual impressive self this season. He led all tight ends with a ridiculous 16.3 yards per reception; the next closest was at 14.8. Gronk was one of just 18 tight ends who had a positive grade as a run-blocker. Armstead made an impressive jump in Year 3, as he allowed just three sacks this season. The AFC West is the place to be for pass-rushing outside linebackers, and Mack is the best of the bunch. Dominant against the run for the second year in a row, he upped his performance in 2015, finishing the season with 16 sacks, eight hits and 58 hurries. PFF's second-highest-graded 3-4 defensive end, Cox racked up 10 sacks, 13 hits and 54 hurries. He was no slouch against the run, either, finishing with 44 defensive stops. Brown was the best wide receiver in the league for the second year in a row. He forced 23 missed tackles en route to 1,834 receiving yards, and he dropped just five of the 141 catchable passes thrown his way. It was a tough season for the Chargers, but Verrett's play was one of the few bright spots. He had just two games with a negative grade in coverage. He allowed 616 receiving yards and three touchdowns while picking off three passes and breaking up three more. Staley has finished every season of his career with a positive PFF grade, and this year was no different. Solid both as a run-blocker and in pass protection, he didn't allow a sack or a hit in the final four games of the season. Donald's first step is terrifying, and it helped him to one of the best seasons ever by a defensive player. He registered 11 sacks, 26 hits, 42 hurries and 51 defensive stops. Boosted by a spectacular second half of the season, Baldwin was the top Seahawks receiver. He dropped only two of the 80 catchable passes thrown his way. This was the Martin of his 2012 rookie season, and then some. He forced 57 missed tackles and had the second-most rushing yards in the league. A tight end who doesn't get the credit he deserves, Walker was very good both as a receiver and as a run-blocker. He forced 16 missed tackles in the passing game, tied for the most at the position. Williams had a positive PFF grade both as a run-blocker and in pass protection for the fifth straight year. He gave up just two sacks. What do Cardinals think of Ginn now?